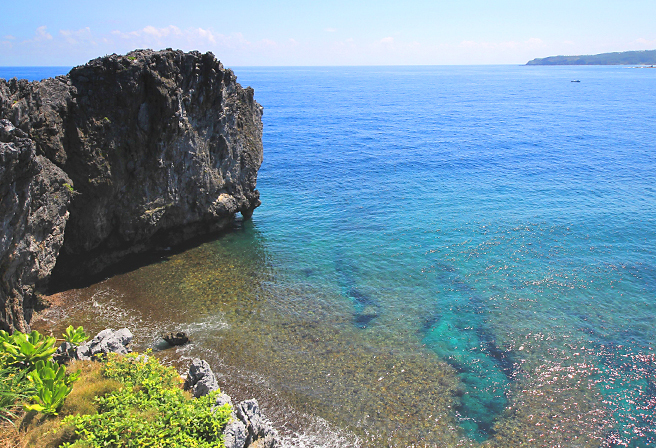 Located roughly 120km from Naha city, it takes about 3 hours in a rental car to reach Cape Hedo, the northernmost tip of Okinawa’s main island. Okinawa’s natural and dynamic landscape is spreading out towards the cape that lies far beyond the subtropical forest known as ‘Yanbaru’. The raging waves strike against the cliffs of Cape Hedo, which looks out over the pure blue ocean. When the weather is clear, it is also possible to see Yoronjima and Okinoerabujima at the edge of this magnificent sea where the Pacific Ocean and the East China Sea collide. ‘Cape Hedo’ is one of Okinawa’s sacred locations and at the tip of the cape there is a small place of worship known as ‘Uganju’ in Okinawa. As this is a very holy place, visitors are asked to take care not to disturb the praying of others. In fact, the Yanbaru forest in the northern region is also considered to be a sacred place and the mountain that rises behind Cape Hedo is a holy ground that features in Ryukyu mythology. Now it has become a natural theme park called Dai Sekirinzan Park, a power spot where many visitors come for the power of the Gods. Here one of Japan’s largest banyan trees can be found in the middle of a walking course, and is such a mysterious place that it is even said that a fairy called Kizimuna lives there. There are no convenience stores or shops nearby so it is recommended that visitors eat beforehand, such as at the train station. A place you should definitely visit with your rental car! The Nirai-Kanai Bridge.